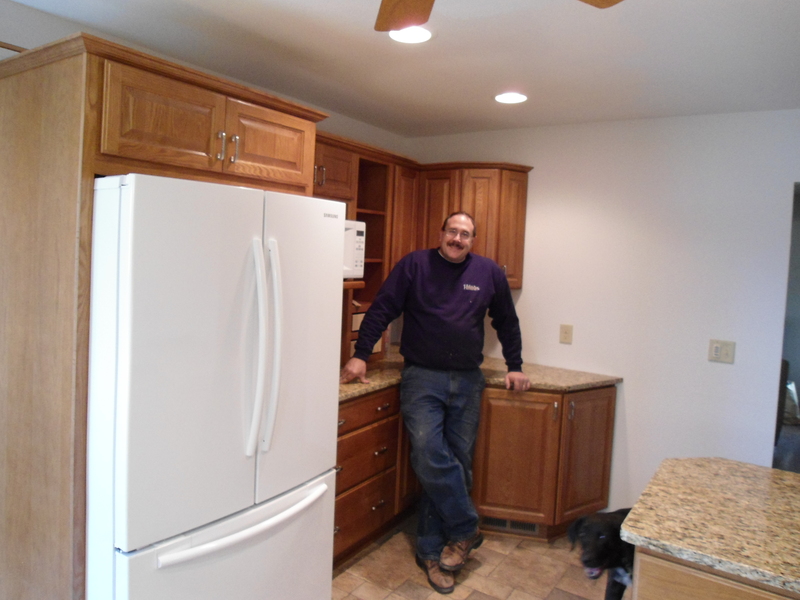 I am a residential remodeler who specializes in kitchen and bathroom remodeling. Cabinets, Yeah!!! For me, and I think the home owners, this is one of the biggest steps. Now you can really see the transformation. This is the time when as the designer I start to sweat. If anything is wrong with the design or the work completed to this stage, it will all come to light as soon as the installation begins. In years gone by, I worried a lot on this day. Now, 15 years later, I have a lot more confidence in myself, but with remodeling the day you stop worrying is the day something goes wrong. Fortunately, and as usual, everything was fine. We are very careful when we order the cabinets to ensure accuracy. We always layout the cabinets full scale (drawing on the floor, or by using tape) on the day of the order. Most companies do not take this extra step, but we feel it really helps prevent time consuming mistakes. 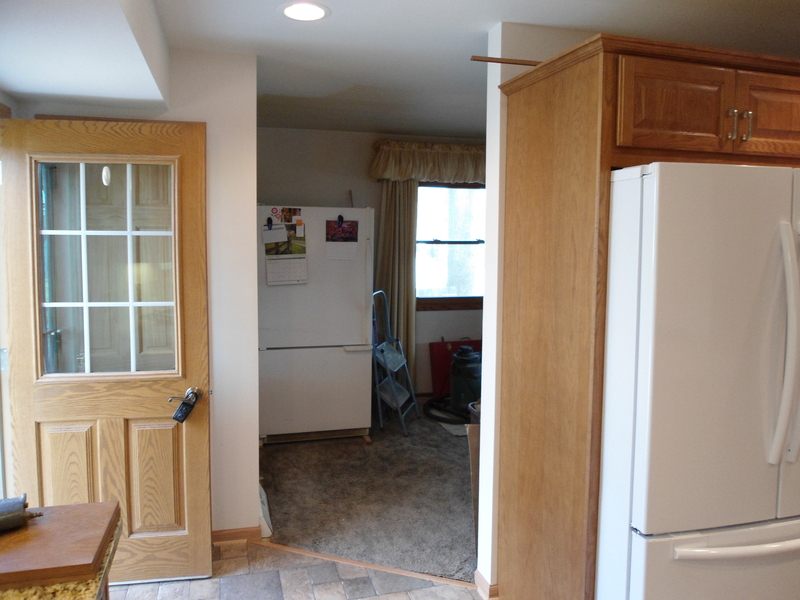 There was 1 cabinet that was not quite right, so we had to place a rush order for a new wall cabinet 3″ larger. This is one of those instances where, we maybe could have “fudged it” but we would rather get it perfect. The good news is it did not create a delay. 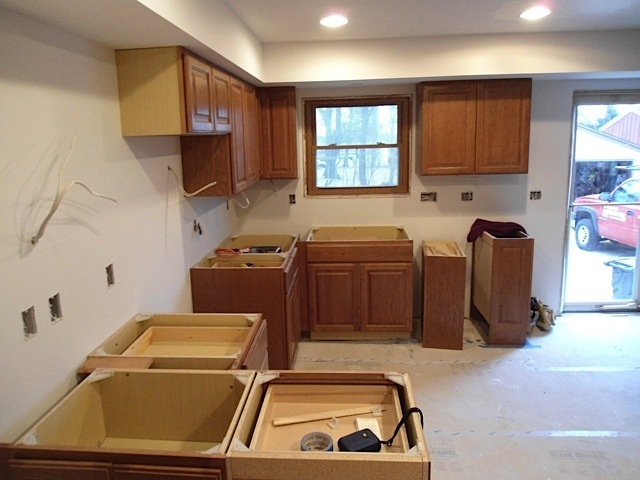 The most important thing is that the base (lower) cabinets get installed so the counter measure can go ahead. 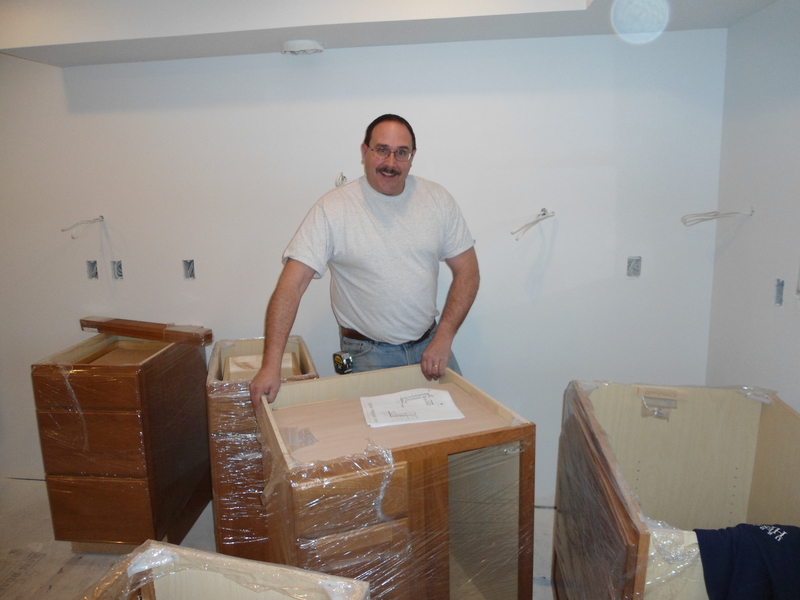 My brother Joe generally does our cabinet install and finish carpenter work. I can honestly say that his expertise and craftsmanship make all the difference in the world. Having him on the site also put my mind at ease because, as he likes to remind me, he can make wood dance. 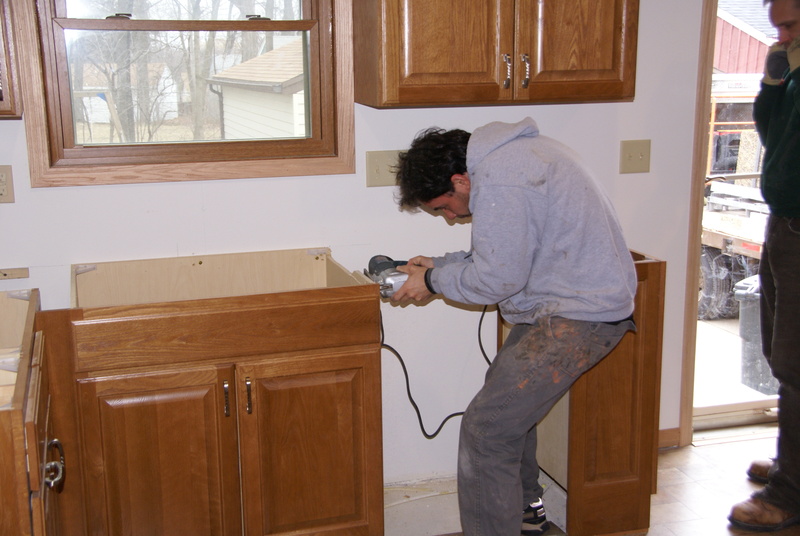 It is not uncommon for Joe to modify cabinets on the site and they always look perfect when he is done. 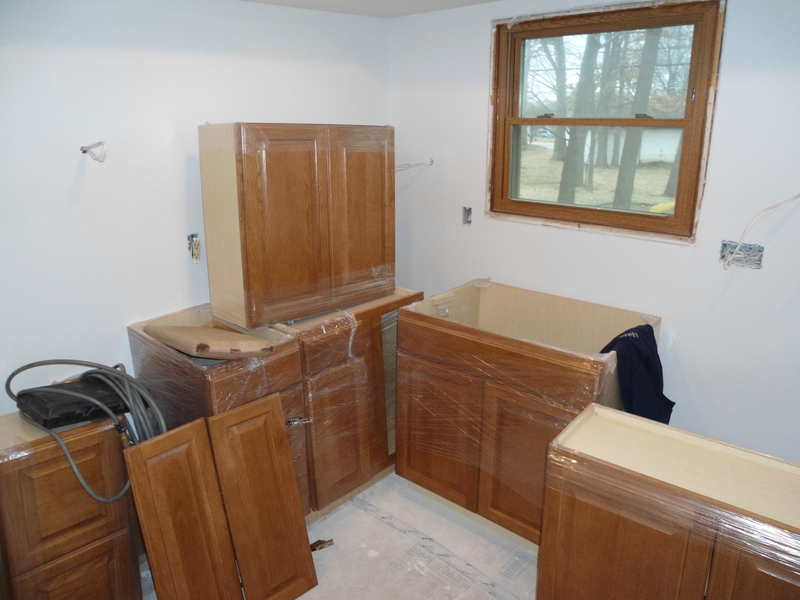 I have seen beautiful cabinets installed poorly (not on our job sites) that look like junk. It breaks my heart to see good money thrown away on a poor install. A good install is everything!!! One of many tasty treats provided by the homeowner. Our guys love that! Thanks! Get crack’in Joe, there’s work to be done. Refrigerator wall. You can see spaces for the fridge and microwave. The little drawers on the wall cabinet are missing their face, but they will be coming soon. 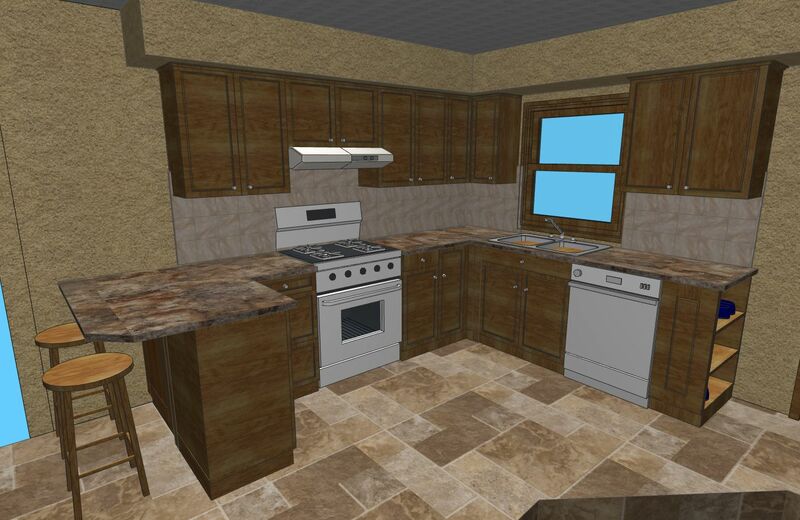 Until the granite is installed in the kitchen we will be finishing up some electrical and other items. Cabinet hardware, vent/hood install and miscellaneous other things. 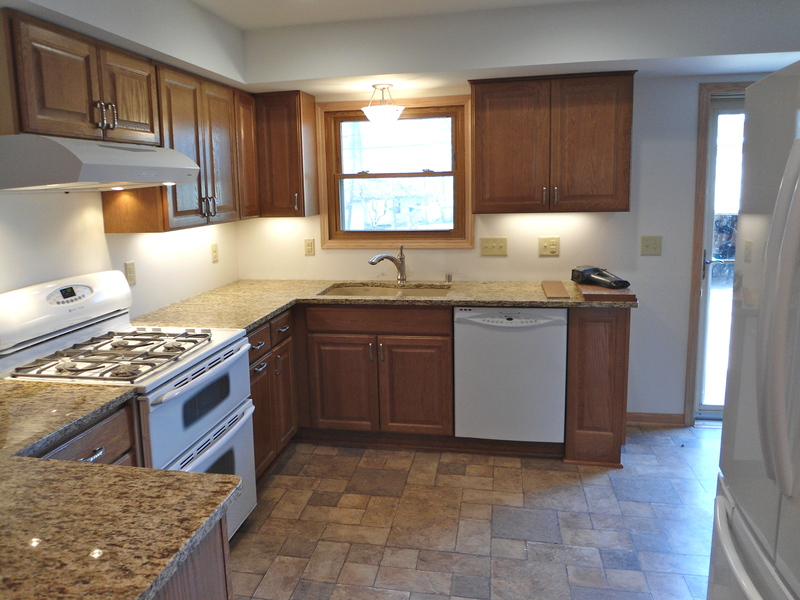 The next blog post will be after the granite countertop is installed. We are almost to the finish line. As with most industries, we have our own special language. Demolition is Demo. Heating, ventilating, and air conditioning is HVAC . 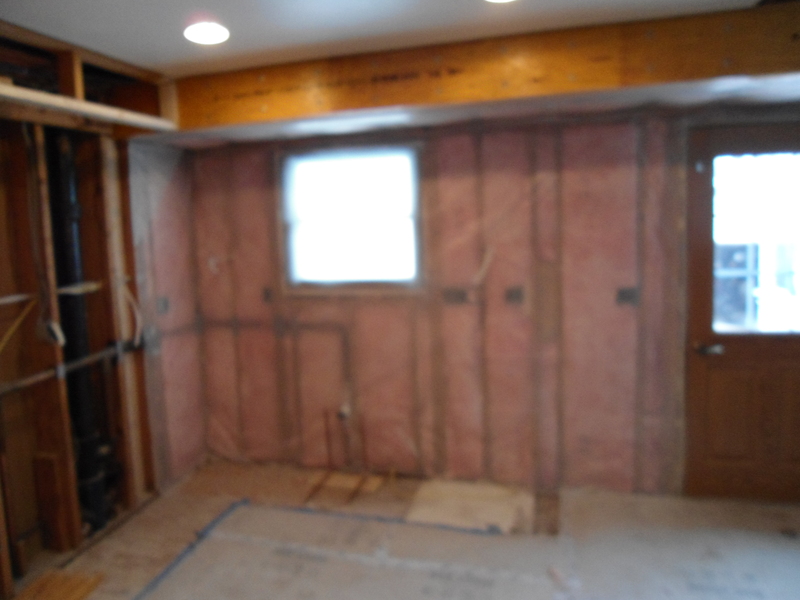 “Rough” is everything after the demo and before the drywall. Today I am going explain the rough electric and rough plumbing. The plumbing needs to be done before the electric because plumbing products are generally rigid and electrical products are smaller and more flexible. This is the wall the range will be located on and it is a good example of a typical wall after “rough”. It shows ducts for venting, black pipe is a 2nd story toilet drain, copper water supplies and typical wiring. In this case the plumbing is fairly straight forward as the sink is staying in the same location, but we had to move the gas line and hook up water for the new refrigerator location. This is also the time to do any duct work necessary for heating or ventilating the house. The rough electric is the wiring and boxes behind the drywall that hooks to your duplex receptacles (plugs), your single pole switches (light switches) and your decorative lighting fixtures such as pendent lights and chandeliers. 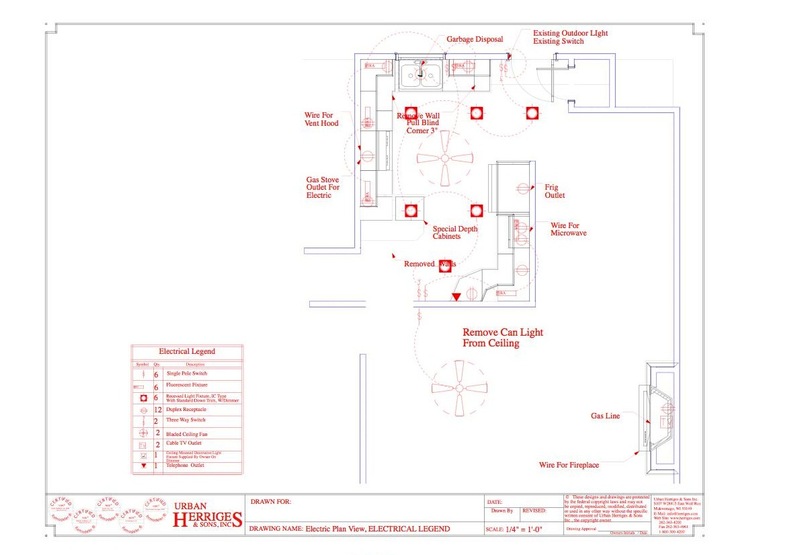 We use an electrical plan to convey the locations and types of product we want used. The legend shows symbols that represent the product and how many of each are included. The plan shows the placement of the items with dashed lines that show which fixtures are electrified together and which switch operates them. Of course once the electrician arrives on the job site our plans may have to change. Existing electrical layout needs to be taken into consideration and sometimes structural members, such as ceiling joist or stud walls are in the way. A common problem is that if a can light is placed over the kitchen sink it cannot be centered because a ceiling joist is there. I prefer to use ceiling mounted fixtures over kitchen sinks rather than can lights for this reason. The box (an actual metal box that contains the wiring that electrifies the light) a ceiling mounted fixture is hooked to is smaller than the recessed can light housing. 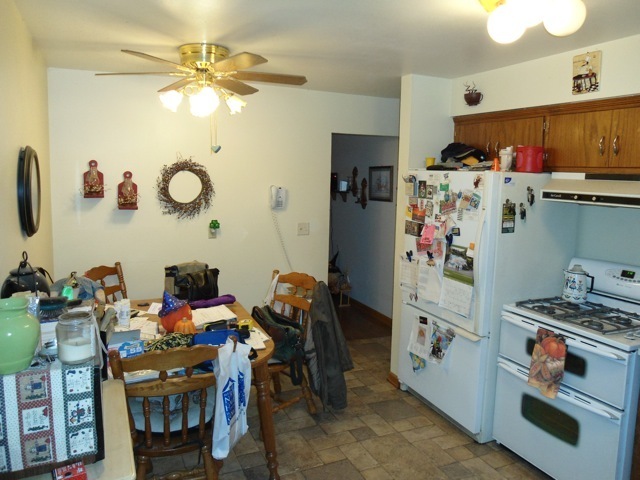 When electrifying a new kitchen it is very important to be familiar with the Wisconsin Uniform Dwelling Code. There are rules as to how many receptacles you need, how far apart they can be, what type of wiring is used and what appliances need to be on their own circuit. 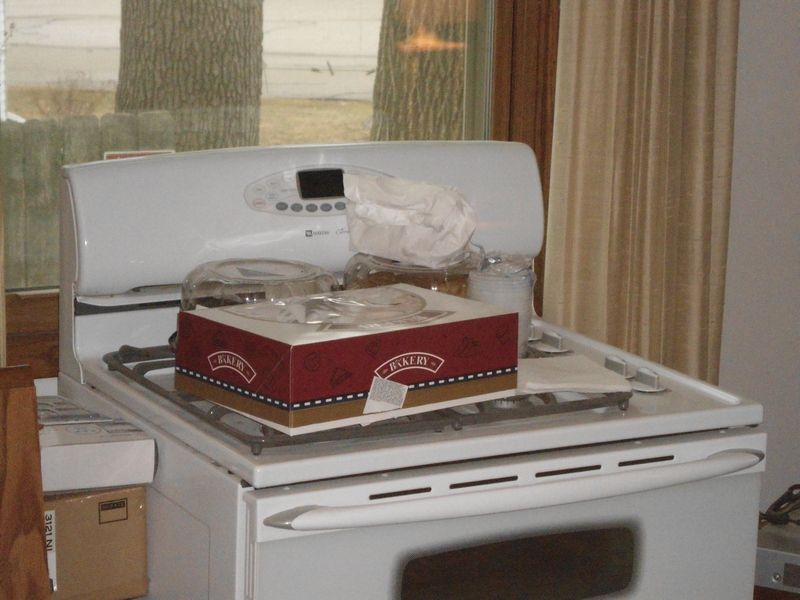 In the not so distant past, you may have had to wait to use your toaster till your microwave was done heating. If your house is up to code appliances like the fridge and microwave will be on their own circuit and you can toast to your heart’s content. After the rough plumbing and electrical are done you will need an inspection from your local municipality. 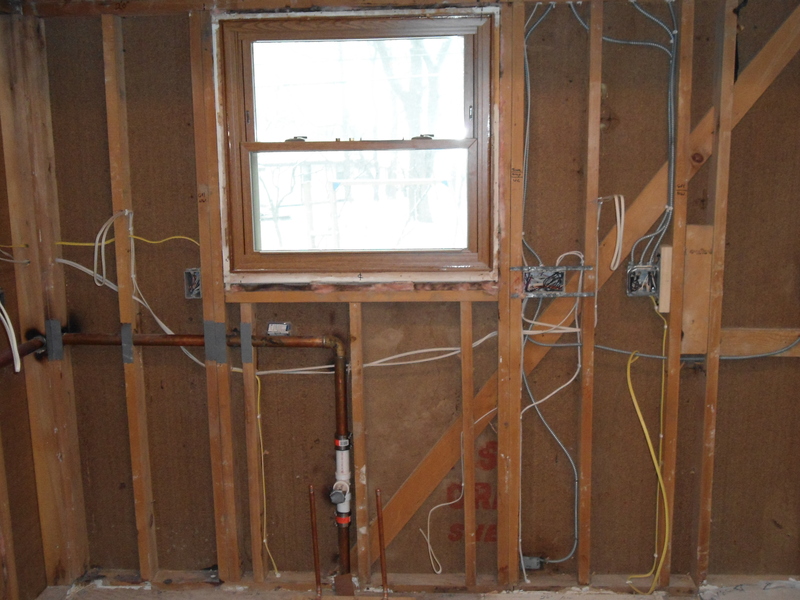 They need to see the plumbing and electrical before the drywall goes up to ensure that it meets code. After the inspection we then do the insulation. 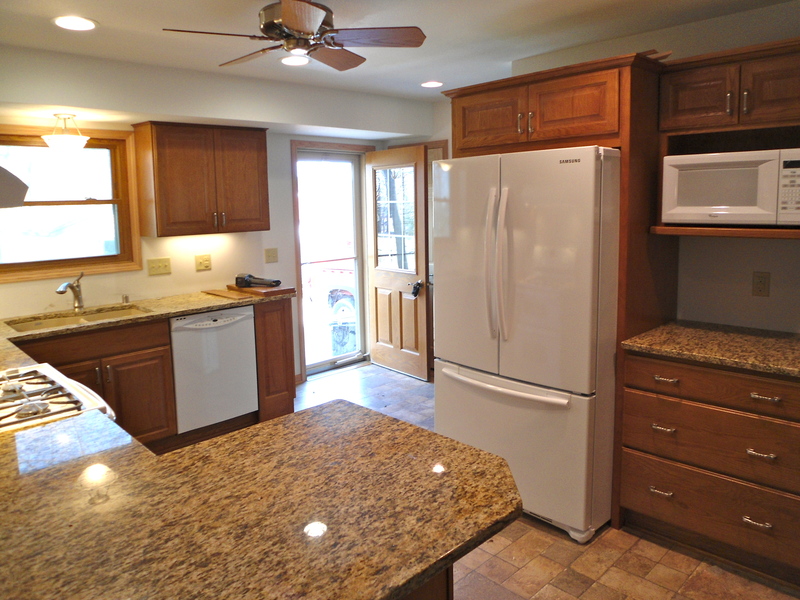 In the case of a kitchen remodel like this one, we re-insulate the exterior walls to meet code. Even if the existing insulation was to code, after the plumber and electricians are done doing their thing, it generally has to be re-insulated. Fiberglass batt insulation is generally what we use. In Wisconsin, a vapor barrier is placed over the insulation on the inside of the wall per code. Finally the walls receive new drywall. Often it seems as if people do not recognize the importance of hiring a professional drywaller. At first glance, hanging and taping drywall may not seem to be as skilled as say, finish carpenter work. I have heard of companies that have carpenters do the drywall work and they are probably capable drywallers. But over the years we have found that using a professional who specializes in drywall and wall finishes is the difference between an o.k. job and a great job. 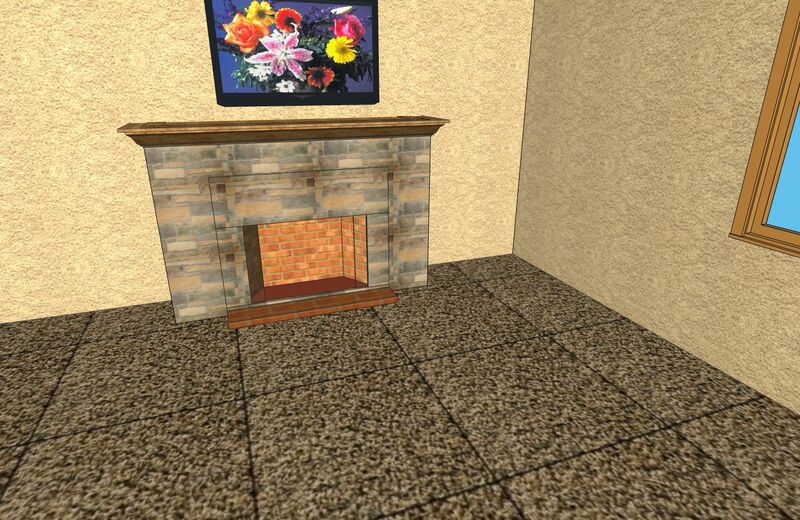 With remodeling, there is often a need to match the existing wall texture. 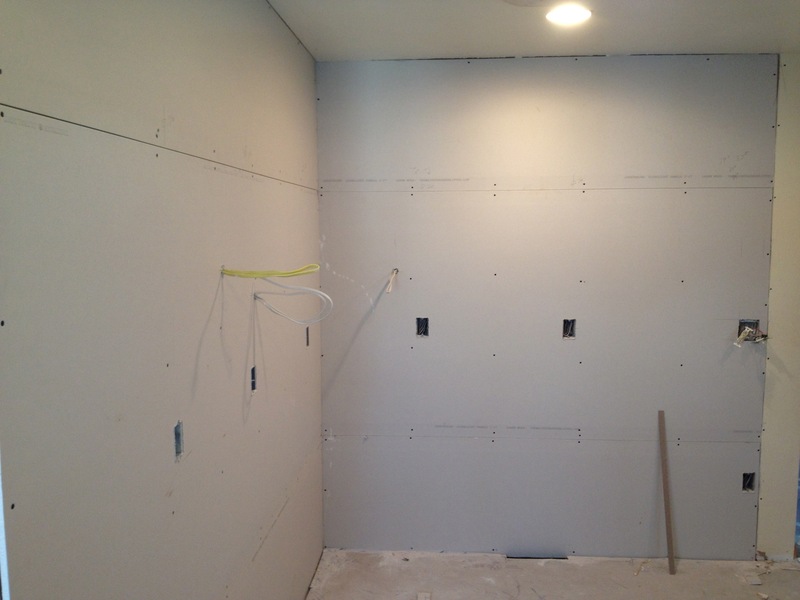 Texturing drywall is an individual process that varies as much as the people doing it. 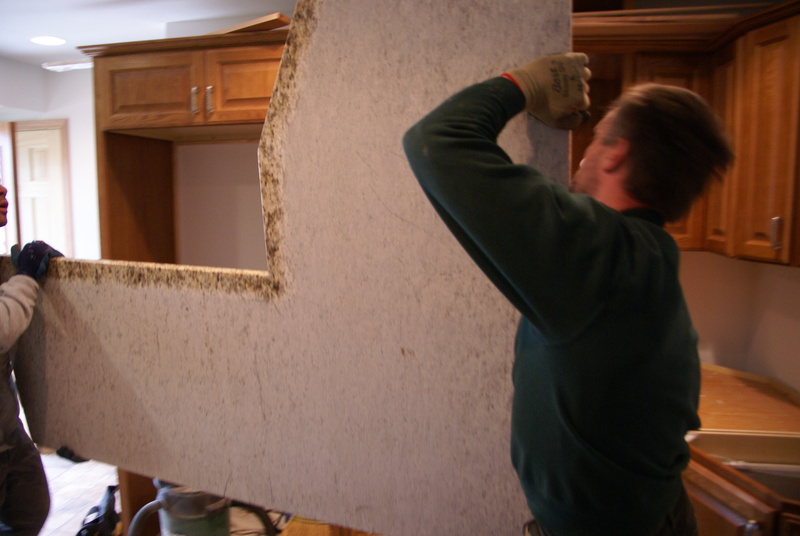 It takes a real professional with just the right touch to blend old and new drywall. Also, if you start looking at ceilings, if you are paying attention, you will often find that you can see the joints where the drywall butts together. A well done drywall ceiling should not show the seams or any nail pops or indents were the screws are located. Now we have a fresh clean palette, ready to receive the cabinets. 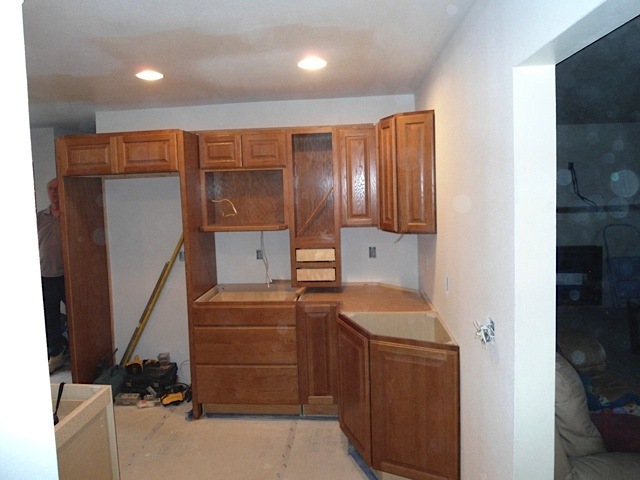 The next post will show the cabinets installed. 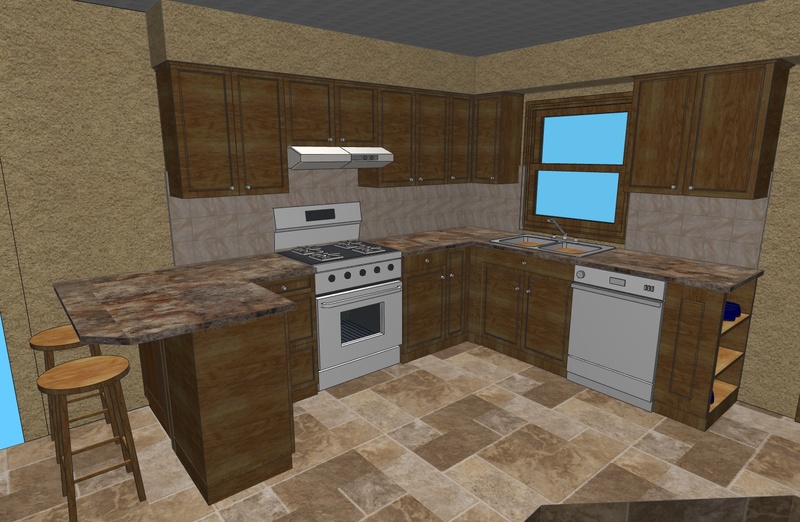 It is the point were you finally get a really good idea of what the finished kitchen will look like. See you then. 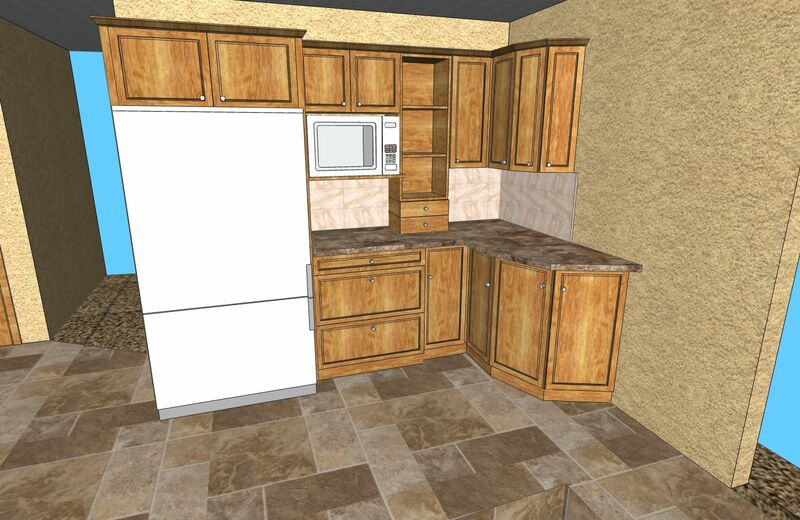 Whenever cabinets are involved in a project we like to order them before we even start the job. This helps to ensure that we can get in and out of a person’s house as quickly as possible. 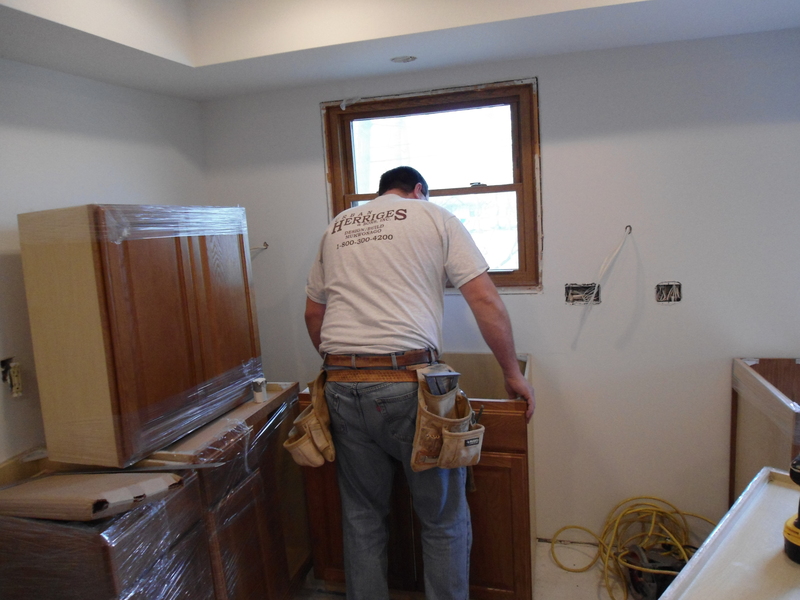 We need to plan enough time from demolition to cabinet delivery for rough plumbing, rough electric and drywall. Before we actually start a job everything is hypothetical. 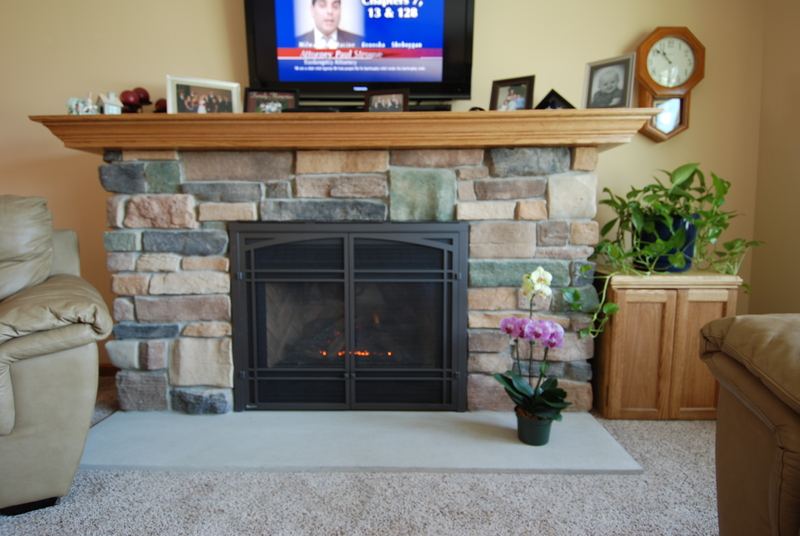 With experience and careful planning, we are able to make a very accurate timeline for ourselves, the subcontractors and the homeowner. But the mystery of what actually lays behind the drywall is always a concern. Cabinets cannot be returned and wood is not as stretchy as I wish it was. Then there is always the worry of “Hidden conditions”. “Hidden conditions” is not a phrase we want to use or you want to hear. 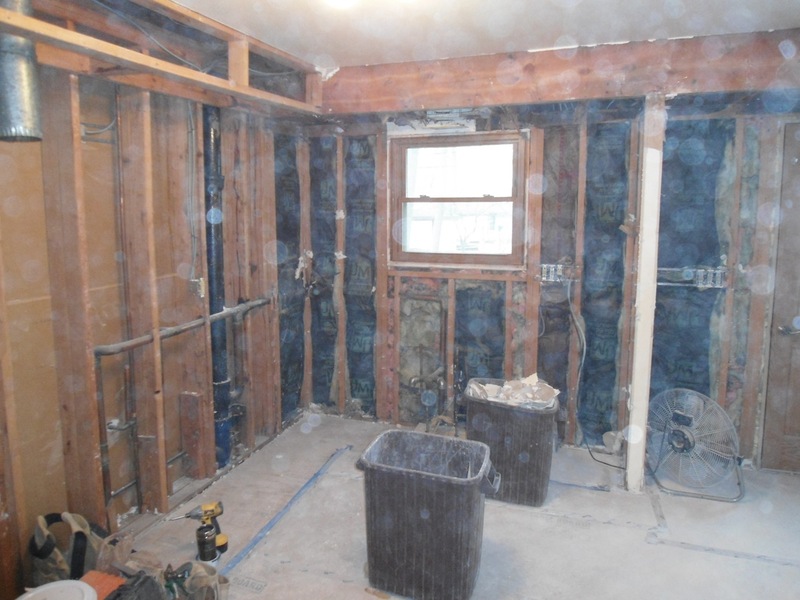 Hidden plumbing, hidden mold, hidden rodent problems, hidden rot, all cost time and money. 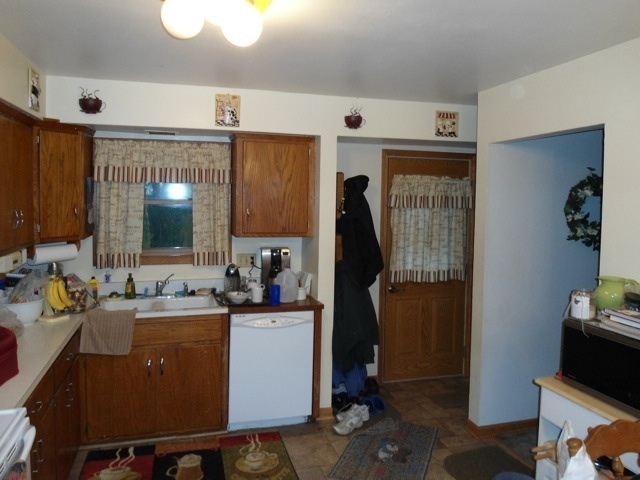 In this case, there were two “hidden conditions” that we already discussed with the homeowner. We were planning on removing a wall that supported a beam above the kitchen sink. The beam was holding up the second story and roof load. We also discussed a heating/cooling supply duct for the Master bedroom that was located in the dining room wall we were planning on taking out. New beam with support wall removed, Dining room wall removed, Duct work in 2nd story wall has been moved to new location. would give the extra strength needed to support the load on the now longer span. Kinda technical, and to be honest, the more complicated stuff gets a little beyond me (had a class on the basics of this in college…still a bit beyond me). This is why Design/Build companies like Urban Herriges & Sons rely on a team of professionals to make sure all aspects of the project are handled properly. So all I really need to know is when to call someone who “knows”. Moving the heat duct was included in the original contract as well, but I was a little worried that after demolition it would be more complicated than we had anticipated. Luckily, moving the heat duct stayed within the allowance we used in the contract. Generally speaking we do not use allowances in our contract language, but in some situations, we use them to bring potential problems to the homeowners attention. There is nothing customers seem to hate more than surprises. The only thing that was a little different then I had planned was the placement of the new beam. I was hoping that it could go on the backside of the existing beam. 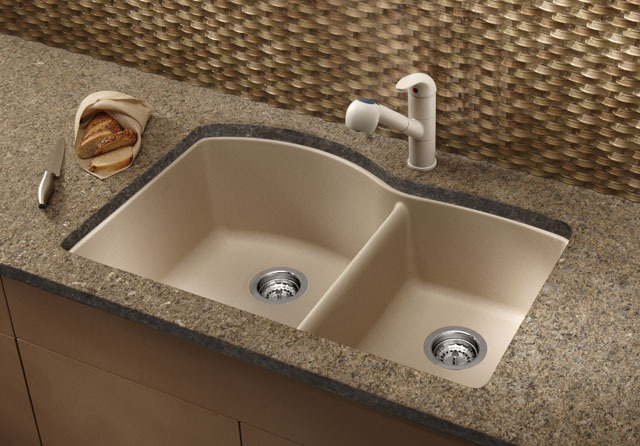 This would have meant we could keep the size of the dropped soffit (drywall area above the cabinets that covers any structural or mechanical items) over the kitchen sink the same. Due to the location of the foundation wall we had to place the new beams in front of the existing beam. Therefore the new soffit above the kitchen sink is deeper than it was before. I would always prefer to see soffits be the same size on all sides of the room. 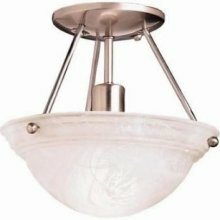 Luckily, the homeowner had already chosen a hanging, relatively large, ceiling mounted light fixture for over the sink. The large size of the light is going to help make the bigger soffit look natural. I think it’s serendipity. The next phase is moving forward as I type. 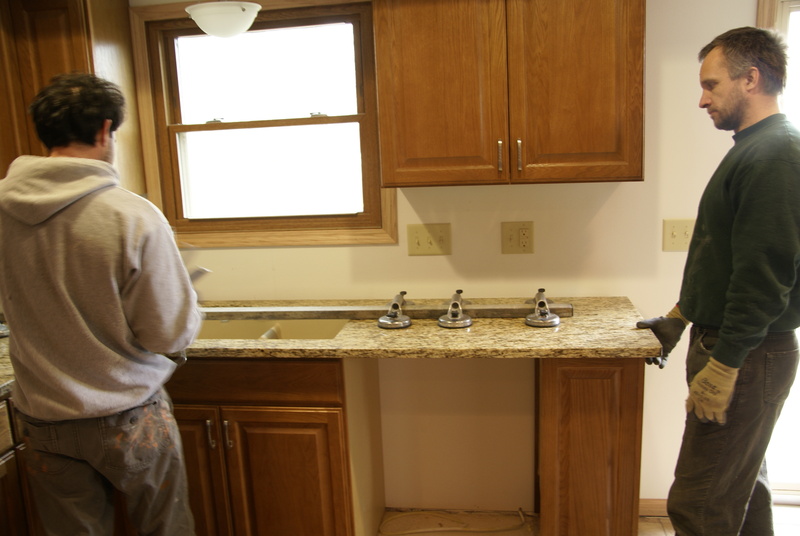 Right now, the plumber is moving the plumbing to match the new layout, which includes moving the gas line to the stove. 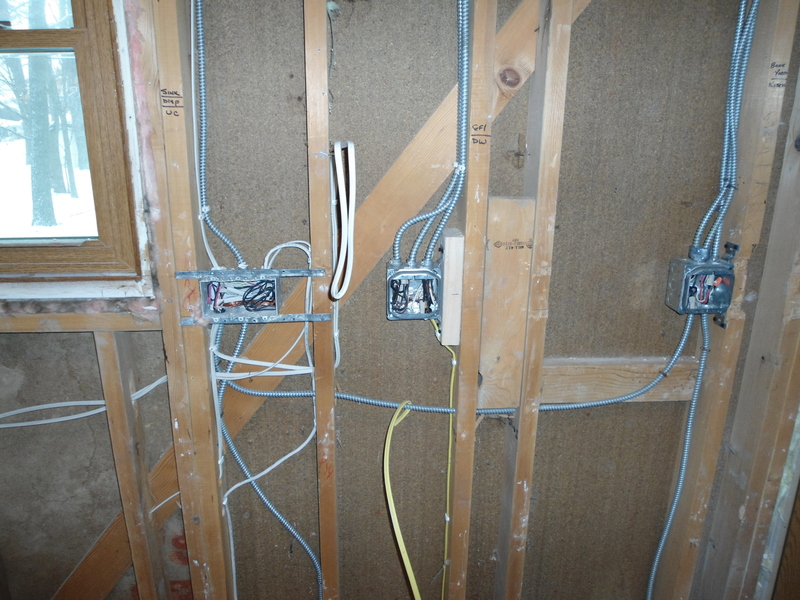 Next, the electrician will be installing all the wires for the new electrical layout and then we start the drywall. 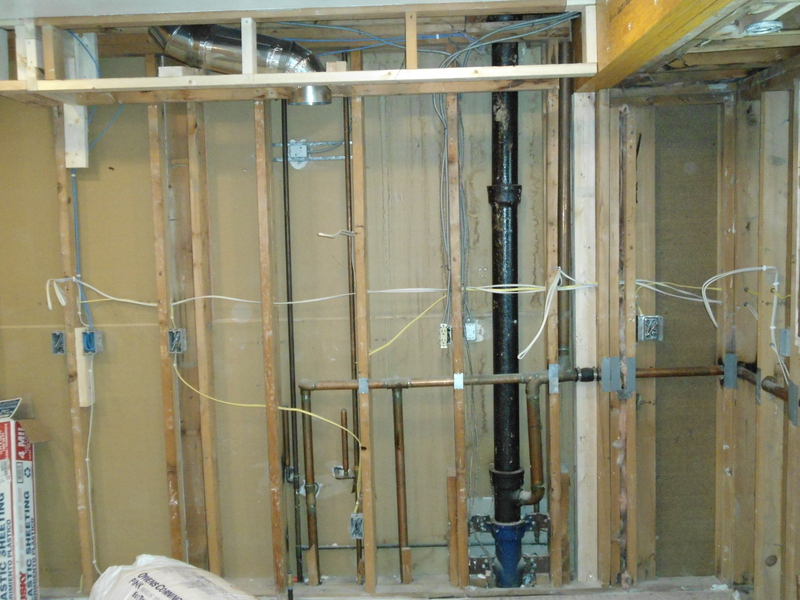 Next week I will share photos of the electric and plumbing after the rough phase is complete. 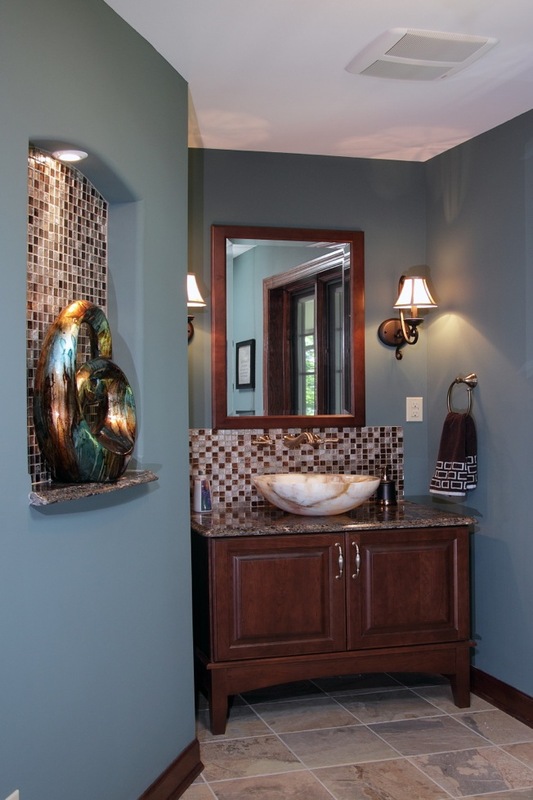 Coming up with a design is one of the first steps to a successful remodeling project. In my opinion, a smart design walks the line between form and function. I see all kinds of beautiful designs on TV and in trade magazines that look great, but would not function well. As with most things, good looks alone will not get you very far. 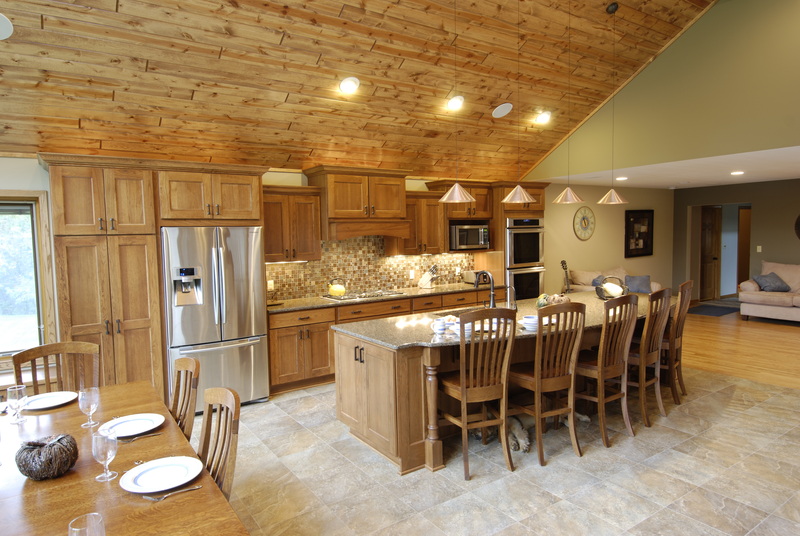 All homeowners have a different vision and communication is the key to making sure that the final product suits the needs and tastes of the homeowner. 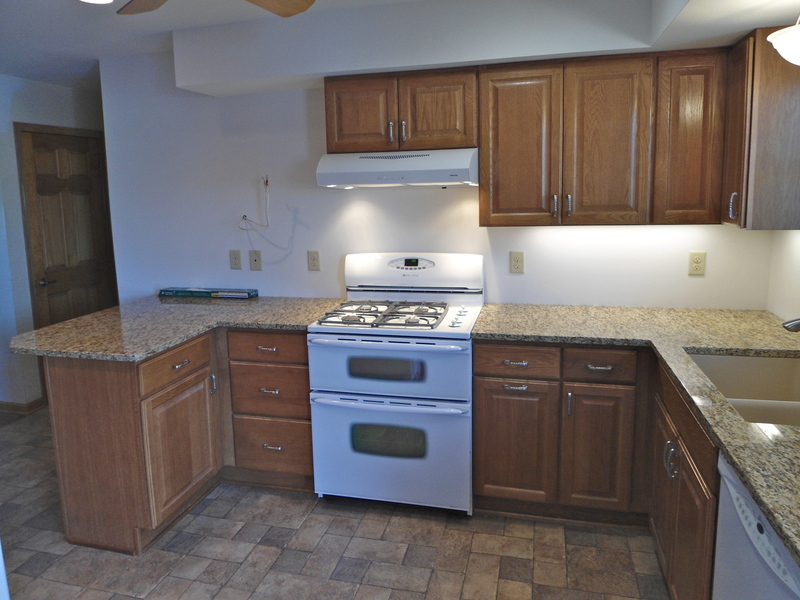 This particular project is a small kitchen, original to the home and badly in need of a change. 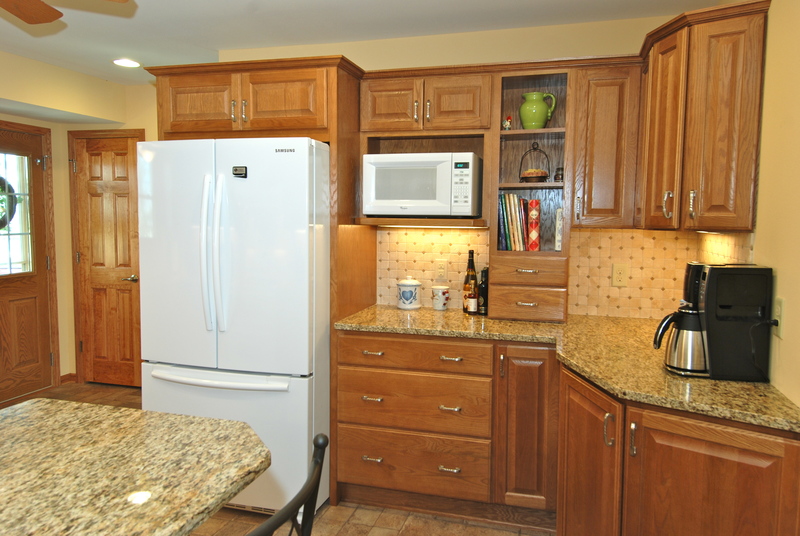 The customer’s wish list included more counter space, island or peninsula seating and more storage. The homeowner’s willingness to go from an eat in kitchen to a peninsula with seating is the first step to making it all possible. The table takes up a lot of valuable space. The original design of the home necessitated small walls at the end of the cabinet runs to support the 2nd story and roof loads. The walls created breaks in the room that visually made it look smaller and took up space that could be counter and storage. 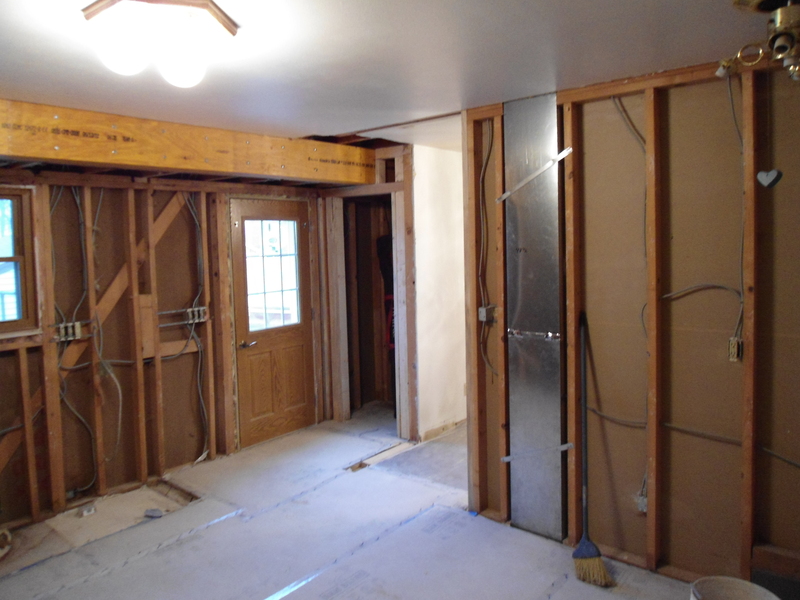 We are also going to remove part of the dining room wall, so when you walk in the back door you are no longer walking into a cramped back hall area, but directly into the kitchen. 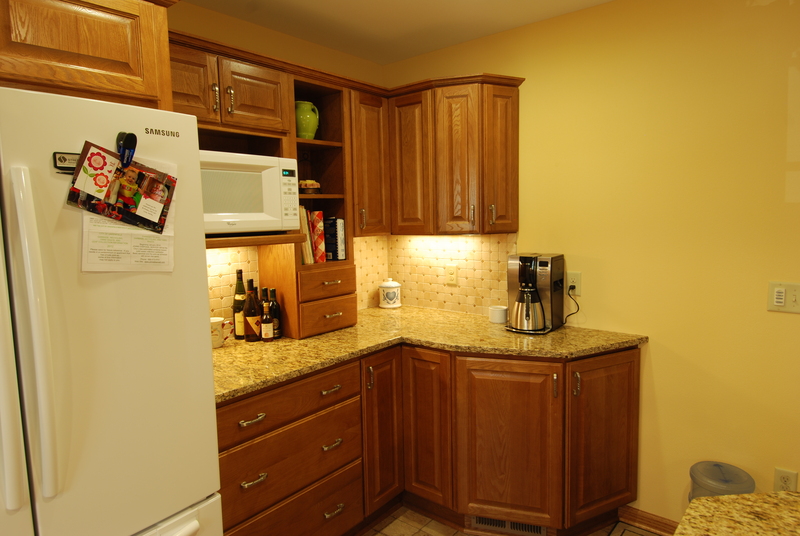 So, after we “eeek” out every last inch of cabinet and counter space, its time to chose the cabinets. 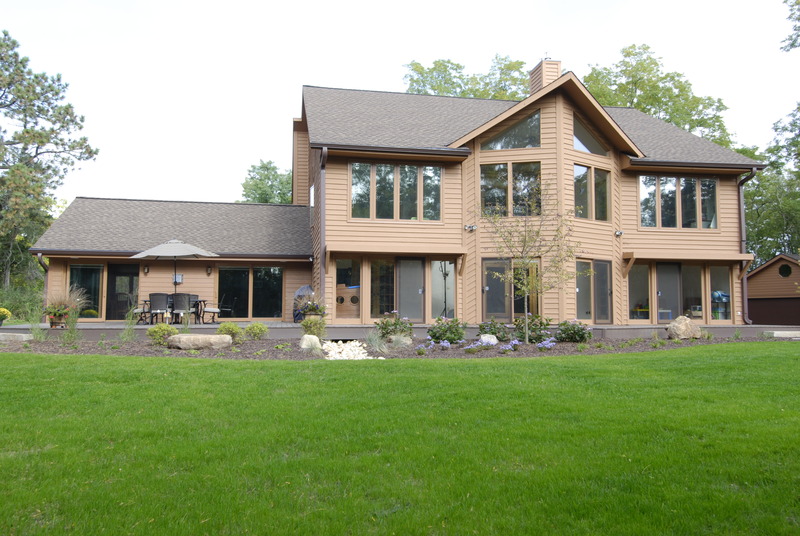 Oak has always been a favorite in Wisconsin and often it matches the original trim in the home, so oak was an easy choice. 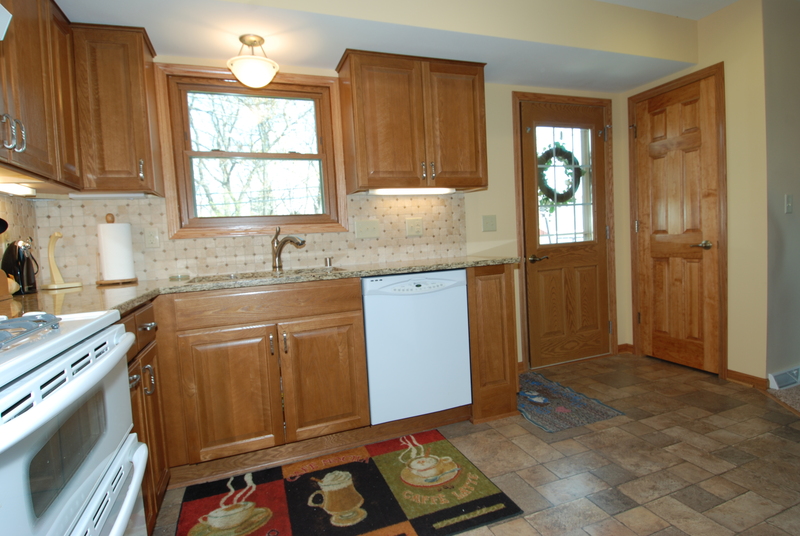 Raised Panel cabinet doors are a traditional style that fit well in a lot of different circumstances. 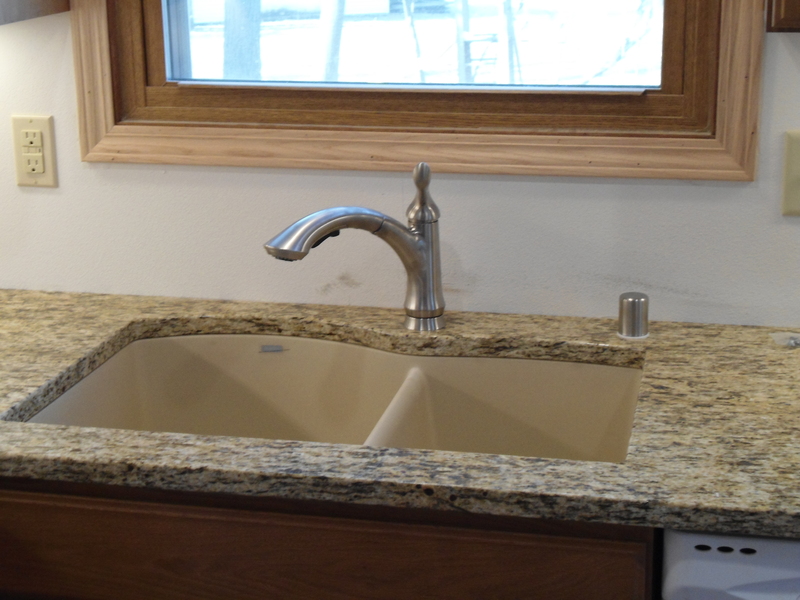 Using granite countertops can be cost prohibitive, but granite’s beauty and durability makes it a worthwhile choice. 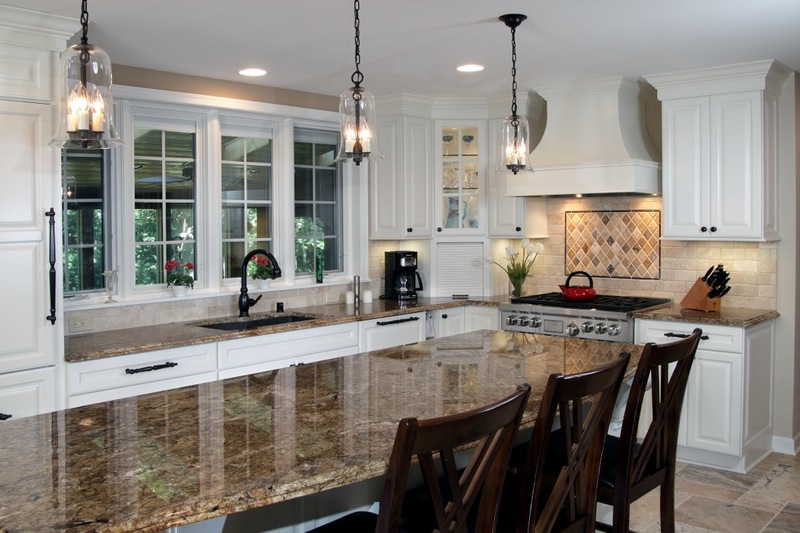 Granite is generally grouped into different price brackets, in this case referred to as Tiers. 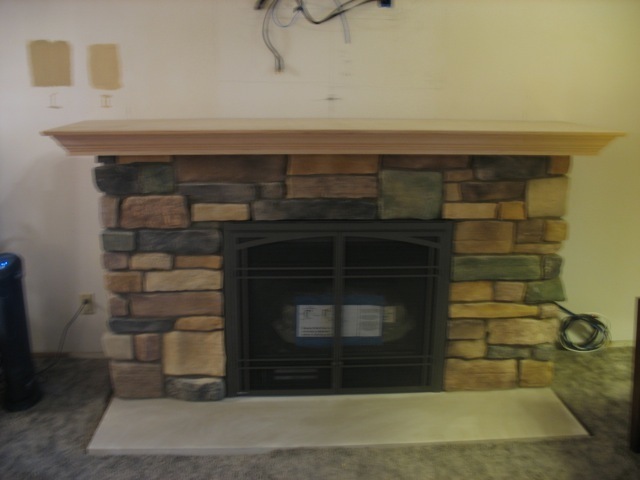 A tier 1 granite is a good way to keep the budget under control while using a poplar and timeless material. 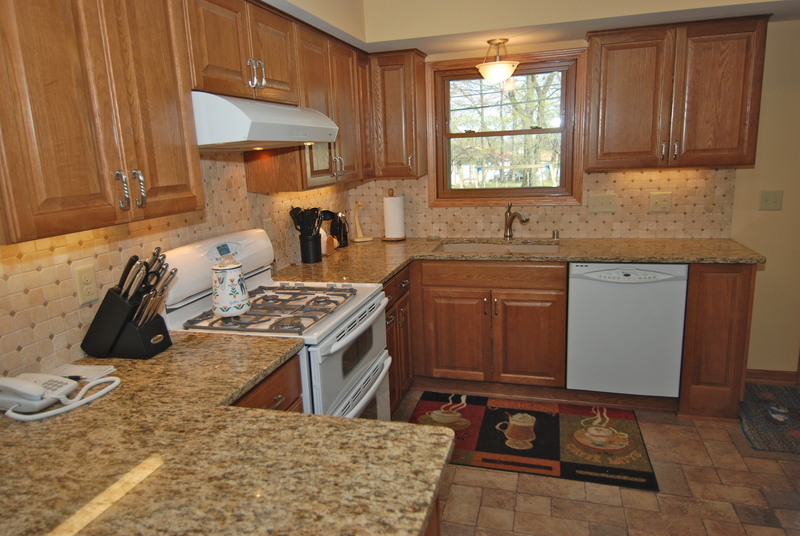 The new countertop will be complimented with a Travertine tile backsplash. The original floor is almost brand new and still available, so we will be patching the areas were the walls are being removed. I hope this have given everyone a good basis to understand the project. The next post will be after the demolition takes place. Hopefully, there will not be any surprises. 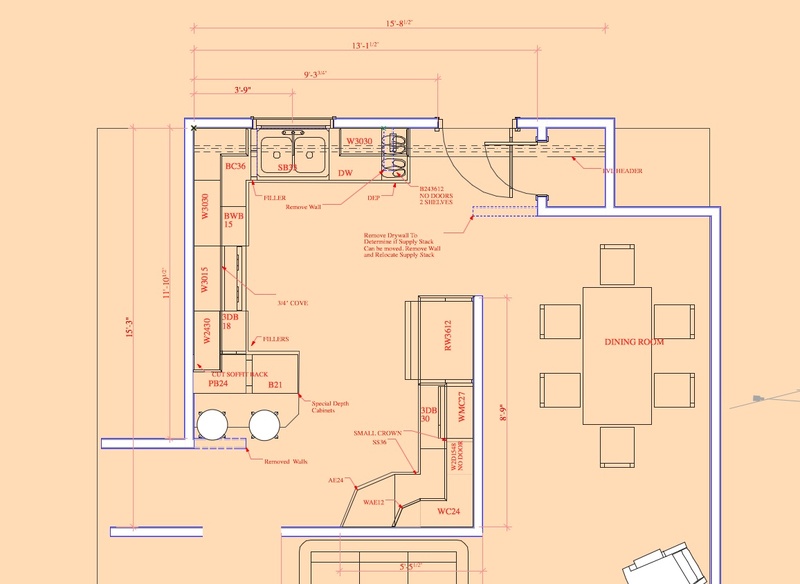 Kitchen Floor Plan: Walls that are being removed are shown with blue eased lines. 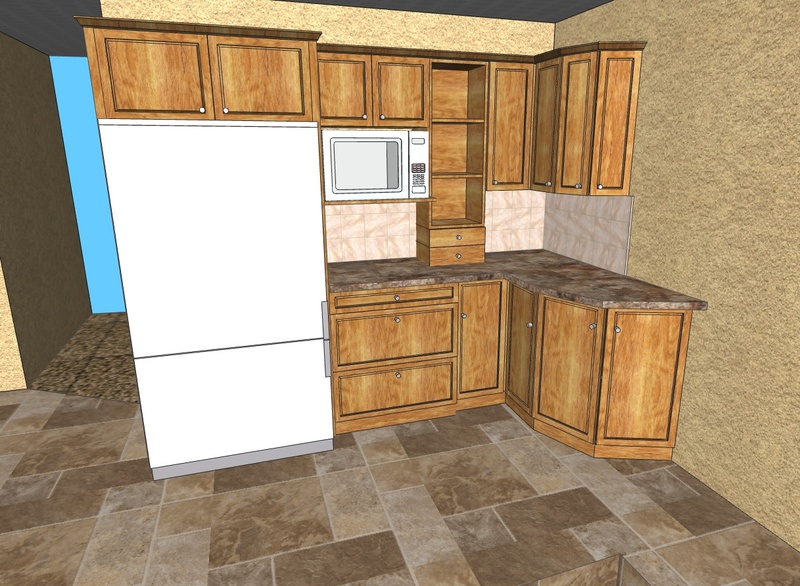 The new layout includes seating for 2 on a peninsula and a base cabinet near the back door to hold shoes.